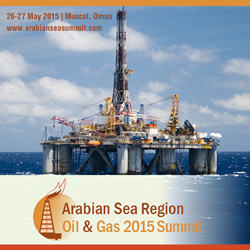 The Arabian Sea Region Oil & Gas 2015 Summit takes place on 26th-27th May at the 5* InterContinental Hotel in Muscat, Oman. The global Summits organiser, IRN holds the senior level conference with the Official Support and Endorsement of the Minister of Oil & Gas of the Sultanate of Oman. The two-day agenda will provide a fascinating and insightful line-up of sessions on sustainable oil and gas field development, an E&P and policies outlook of Oman, Pakistan, India, Somalia and Yemen, the most promising fields, as well as EOR and green solutions for development of oil and gas fields. Amongst the senior level delegation of the Summit will be Oman Oil Exploration and Production, Premier Oil, Oman LNG, Anadarko, BB Energy, Petrogas, MOL, RWE-SUCO, Geofizyka Krakow, Sprint Oil & Gas Services, PECOFacet, Fox Petroleum, Total, the Yemen Oil & Gas Corporation, OIlex, Mitchui Chemicals India, Sprint Oil & Gas Services, Global Geophysical Services and many others. The Petroleum Federation of India, the Middle East Association, the Oman Society of Engineers and the International Gas Association – CEDIGAZ act as supporters of the Summit. Solarlite, the company that provides environmentally friendly solutions to operators of mature fields, is a gold sponsor of the Summit. More information about the Summit can be found on http://www.arabianseasummit.com and about the organisers, IRN, at http://www.irn-international.com. On the Summit’s website, it’s also possible to subscribe to the Summit’s newsletters. IRN offers daily updates about the project in their LinkedIn Group – ‘The Oil & Gas Network’ and their Twitter account - @IRN_OilandGas.